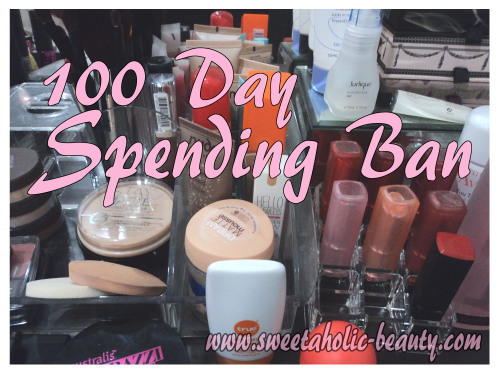 Today is day 100 of my Spending Ban. I've actually finished the ban! I've finally reached the finish line, and I have to say I'm very proud of myself. The first time I tried a spending ban, I failed miserably. The second time I tried it, I put pressure on myself - firstly by announcing it to be a certainty among the blogging community and my friends & family - but also by creating that nifty little picture! Without all that pressure, I can imagine I probably would have failed yet again. I thought for this update, I'd run through all the temptations of my previous updates, and let you know how much they have changed! Essence Cherry Blossom Girl Collection - I ended up receiving practically the entire collection for my birthday, so luckily it didn't tempt me for too long! In retrospect however, I realise now I didn't need the whole collection. Colette 50% off Sale - I'm so much fussier with what I'm spending my money on now! During the ban, my purse broke and I strolled into Colette thinking I'd find another one easily. I ended up being so fussy (since I knew I could only have one) that I ended up with nothing, and I'm still stuck with my broken purse! My mum visiting - This was probably one of the hardest ones, because we always shop together, and she always has a lot of money to spend on goodies! She's visiting again just after my ban, so I guess we'll see how it goes. Although this time I think I'll be a little more frugal! Ikea - Well I ended up with very few things from Ikea (only the things we actually needed) and the thought of going back there makes me excited, but when I think about it, I can't think of a single thing that I want? My birthday spree - For those of you who don't know, my boyfriend let me go on a little spending spree for my birthday at his expense. I didn't end up with everything I thought I would, and found it difficult to even spend all the money (in Australia at least!) I was considering overspending and buying heaps of things online, but I couldn't do that to him! He offered me a similar experience for our anniversary just passed, and I found it super hard to even find anything online I wanted that fit the budget! Clothing - With winter coming, I wanted a lot of new clothing! But, now that winter is practically here (damn Autumn in Melbourne!) I'm readjusting to my old wardrobe and haven't actually seen much that I like recently! Essentials - I noted in my fourth update that just heading out to buy essentials was a huge temptation for me to buy more goodies! I needed more essentials a few days ago and found myself not even interested in them anymore! Usually I love the soap/hair care aisle in Coles, yet I didn't even go down there. I usually always make up an excuse to go down there. A Growing Wishlist - Some people asked me if my wishlist has changed over the period of the ban, and it definitely has. I'm finding myself lusting after far less these days, and things I wanted before don't seem as important anymore. Other blogs - Again, this will always be difficult, I think! Seeing something that somebody else has, all pretty and new, makes me want it! Although I've learnt to tell the difference between something that's just pretty, and something that's pretty and useful! Parcel Forwarding Service - I actually put through a dummy order to see how it went, and seeing the price on the screen almost made me go "Oh that's too much!" But I decided it's a lot better than spending up big here, so I think discovering parcel forwarding is a good thing - yes, even for my wallet! So as you can see, I've really changed from the spend-crazed woman I used to be! I'm so much fussier now, and I'm finding myself less willing to give away my money on the first shiny lipstick I see! Although I still want a lot of things, I've had a lot of fun playing around with the makeup I already do own! I really want to say a big thank you to everyone who supported me through. My boyfriend and my friends, my sister, and my mum. All of you took my shopping throughout this experience, and you all didn't let me spend. All of my blogging friends, who commented on my posts and encouraged me to keep going - that there was a light at the end of the tunnel! All of my PR contacts, who offered my goodies to review during this tough period - a big thank you to you all! I would never have made it if it weren't for all of you! Prepare to see some hauls! Thanks hun! I didn't think I'd be able to do it! Thanks Marie! You swapping with me definitely helped the process hehe! Good job :) I am inspired by your dedication . I wish i could resist buying stuff like you did. Congratulations!! I can't wait to see a haul or two now it's over, especially now you'll be selective it'll all be great products. Congratulations on completing the spending ban so successfully!!! Congrats!!! I've given up on spending bans, I always fail :P I admire your dedication! You did an amazing job, i don't i would have been able to last as long as you. You did it, you go girl!!! Wow congratulations on reaching 100 days, what an accomplishment! I always fail at spending bans... things tempt me too well! It's great to hear that you lust for products much less- I definitely should try to change my mindset too :) What an awesome boyfriend to give you a budget to buy some things but shame that it didn't allow for much! I really want to try parcel forwarding but I'm not sure how I would go about doing it, how do you do yours? Congratulations again for all that willpower! Thanks Karen! My boyfriend was so supportive throughout the whole thing so it definitely made it easier! Hahaha thank you! And woo go you too! Aw thank you hun! I know you know how hard it was, you had to put up with my constant twitter complaining haha! I'm pretty sure my mindset will be like that now because half way through I sort of got disinterested with even looking at stuff! I'd hate to live in a smaller place with less storage, but I can imagine it's good for the wallet haha! Congratulations lovely! I loved reading all of your updates, I can't believe it's been 100 days already :) time flies! Thank you Norlin! It really is funny, I can't believe how much stuff I wanted but now don't even care about! Sounds like you've got some good reasons for no spending though! Good luck with the new job!